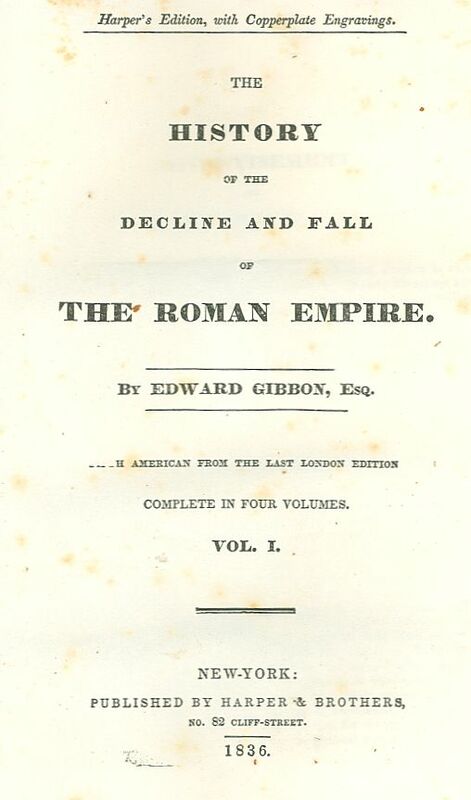 The History of the Decline and Fall of the Roman Empire – The History of the Decline and Fall of the Roman Empire[a] was written by the English historian Edward Gibbon, which traces Western civilisation (as well as the Islamic and Mongolian conquests) from the height of the Roman Empire to the fall of Byzantium. It was published in six volumes. Volume I was published in 1776 and went through six printings. Volumes II and III were published in 1781; volumes IV, V, and VI in 1788–1789. The original volumes were published in quarto sections, a common publishing practice of the time. The work covers the history, from 98 to 1590, of the Roman Empire, the history of early Christianity and then of the Roman State Church, and the history of Europe, and discusses the decline of the Roman Empire in the East and West. Because of its heavy use of primary sources, unusual at the time, its methodology became a model for later historians. This led to Gibbon being called the first “modern historian of ancient Rome”. His work remains a great literary achievement and a very readable introduction to the period, but immense progress has been made by later historians and archaeologists, and his interpretations no longer represent current academic knowledge or thought. For example in The World of Late Antiquity (1971) by Peter Brown, he offered a radically new interpretation of the entire period between the second and eighth centuries AD which contradicted Gibbon in many ways, and in Framing the Early Middle Ages (2005) by Christopher Wickham which is exceptional for its use of hitherto unincorporated evidence from both documentary and archaeological sources, underlines it. I will append a single proviso to my five-star rating: to enjoy this book, you will need a somewhat decent command of the English language and the capacity to unpack dense meaning. Gibbon’s prose, to my mind, is almost without par; however, it is very much written in the Enlightenment style, which was more complex than what we accustomed to from today’s workman-like scribblers. Therefore, if you dislike long, complicated sentences, it’s probable that you won’t enjoy this work. Also if you’re a teenager, I might suggest you perhaps start with someone like Will Durant, who has a nice style of his own, but is much easier for the youngsters to comprehend. Unless you’re a whizz kid, then by all means jump on this immediately. “Of the various forms of government which have prevailed in the world, an hereditary monarchy presents the fairest scope for ridicule. Is it possible to relate without an indignant smile, that, on the father’s decease, the property of a nation, like that of a drove of oxen, descends to his infant son, as yet unknown to mankind and to himself, and that the bravest warriors and the wisest statesmen, relinquishing their natural right to empire, approach the royal cradle with bended knees and protestations of inviolable fidelity? Satire and declamation may paint these obvious topics in the most dazzling colours, but our more serious thoughts will respect a useful prejudice, that establishes a rule of succession, independent of the passions of mankind; and we shall cheerfully acquiesce in any expedient which deprives the multitude of the dangerous, and indeed the ideal, power of giving themselves a master. If you were able to read those three paragraphs without much trouble, and understood exactly what he was saying, then you should be to digest this work. Pay attention to the style, too. Do you like those long sentences, the vivid imagery of the wordplay? Some people do not. If you are one of those people, you will not make it through this work (it is almost 4,000 pages). Some people call it florid. I don’t agree. I love Gibbon’s style, and was disappointed after finishing the sixth volume that I had no more to read. Not to worry, though, as it holds up exceedingly well to repeat reading (usually I just return to read a chapter here, or there, on whatever topic I am interested in at the moment). Also pay attention to not just the style of the above three paragraphs, but the viewpoint Gibbon was expressing. Keep in mind, Gibbon wrote in the 1700s. His viewpoint is hardly postmodern, and he is a particularly stern judge in almost all respects: of history, of character, of society. That said, his book remains remarkably (but not entirely) free of racial bigotry. You only need to look up some of Immanuel Kant’s quotes to realise that how exceptional this is for the period when Gibbon wrote. Be assured, however, that you may not agree with many of Gibbon’s opinions. If you can’t suspend your judgement when you read, if you only like to read authors whose you sociopolitical views you share, then you may not be able to stick this one out. My suggestion would be to try, however. On to the actual material Gibbon covers. If you’re looking for any material on Rome under the Kings, Republican Rome, or the early Empire, then you’ve come to the wrong place. Gibbon does provide us with a brief, single-chapter account of the Empire and its Emperors from Augustus to Domitian, and two opening chapters on the age of the Antonines (which Gibbon and most scholars consider to have been the peak of the Empire in almost every respect). The real narrative, however, picks up with the death of Marcus Aurelius and the accession to sole rule of his son, Commodus, in 180AD. If you don’t know much Roman history, and these names are still familiar to you, perhaps you’ve seen Gladiator? Marcus Aurelius is the old Emperor whom Russell Crowe serves at the beginning. Commodus is the Joaquin Phoenix character. That film wasn’t really based on any true story, but these definitely were father and son in real life, and incidentally Commodus really did things like fight as a gladiator. Some of the stories Gibbon tells are quite amusing. We hear that Commodus had special arrows made, whose tips were shaped like crescent moons. He could, apparently, decapitate a sprinting ostrich by firing one of these from his bow. Commodus thought nothing of killing a lion in single combat. An elephant too. All in the arena, as his subjects watched. Some stories about other Emperors are clearly far-fetched:we are told the Emperor Maximin (known to us as Maximinus Thrax) was over 8 feet tall, could drink 7 gallons of wine and eat between 30-40 pounds of meat in a day, could break a horse’s leg with a punch, and crumble stones in his fists. However, Gibbon is a sober historian. He never falls for a tall tale. If he tells one, it is for amusement or colour. He always provides his sources, and he is an astute judge of a source’s quality. Gibbon always, if possible, practices what he calls “ascending to the font,” by which he means never settling for a secondary source if a primary source is available. All these traits made him remarkable as a historian for his period. Volume I takes the reader until the triumph of Constantine the Great over his rivals in the early 4th Century AD. It then concludes with the first of what were considered the most controversial chapters of the book. Volume II begins with the second. These “controversial” chapters (15 & 16) dealt with the origin of Christianity, and its character and evolution in the roughly three centuries until Constantine founded Constantinople as a new, Christian Rome (Constantine actually called it Nova Roma, but the people were having none of that). Now chapters 15 & 16 caused quite the stir in Gibbon’s day. You can go and read on Wikipedia about the accusations made against Gibbon because of what the chapters contained. Honestly, though, for the twenty-first century, they are extremely tame. It is to Gibbon’s credit, however, that throughout the book when he does dedicate chapters entirely to religion, he at least in most cases avoids inflicting terminal boredom on the reader. Volume II takes the reader until the first part of Theodosius the Great’s career. Volume III shoots just past the end of the Empire in the West, ending with a chapter on some of the barbarians who came to exercise sovereignty in the former Imperial lands. Volume IV covers Justinian and his immediate successors, still ruling as the Roman Empire in the East, and in the West continues covering the Barbarian successor kingdoms. The scheme of the work changes a little when the reader arrives at Volumes V and VI. Gibbon did not put much stock in the so-called Byzantine empire. In the final chapter of Volume IV he in fact covers 800 years of Byzantine empires, whereas he had just spent four volumes covering about half that amount of time. So if you were hoping for an extremely in-depth coverage of the Byzantine Empire, you’ll be sorely disappointed, as I initially was (if this is the case, I suggest you look to the excellent works of John Julius Norwich). Instead, in Volumes V and VI, Gibbon covers the histories of the nations erected on the ruins of the West Roman Empire, along with those territories lost to enemies in the East. This takes the reader through a varied journey: the Caliphates; the Turkish Sultanates; the Crusades and Crusader Kingdoms; the exploits of the Normans in France, Italy, and elsewhere; the Bulgarians; the Hungarians; Russia; the Papacy; the Italian states; and more. All said and done, the complete work took me about 15 months to read. I took my time, reading about half an hour per day. Some days I’d read an hour, some days only ten minutes. I made sure to read it every day, however. Take your time. Get into a habit of reading this, one bite-sized chunk at a time. You’ll be glad you did.